As a parent, you love your child and absolutely cherish spending time with them. At the same time, you secretly love breaks from your child where you aren’t forced to watch Paw Patrol episodes over and over AND OVER! If that describes you in anyway, we’ve got a resource that you need to hear about. It’s called the Head Start Program. In addition to giving you a much needed break to rest and run errands, the head start program also provides your child with the foundation needed to excel academically and fit in socially once they reach kindergarten. If all this sounds fine and dandy, continue reading and I’ll tell you about the basics of head start. 1.0.1 What Is Head Start? 1.0.1.2 Are Head Start Programs Free? 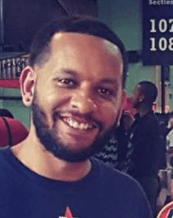 1.0.1.3 What Zip Codes Do Houston Head Start Serve? 1.0.3 What Services Do Houston Head Start Programs Offer? 1.0.4 What Services Do Houston Head Start Programs Offer To Families? 1.0.5 What Documents Are Needed To Register For Houston Head Start Programs? 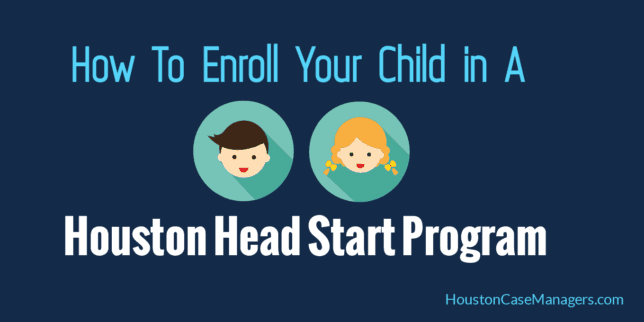 Before we tell you how to enroll in a Houston Head Start, we are going to break down the basics of this program. Head Start is essentially a free pre-school program for children. The program helps kids to prepare for school by introducing them to new environments with classroom instructions, social interactions, and play time with their peers. As aforementioned, the program is free, but to qualify families must live in specific zip codes and meet income guidelines. 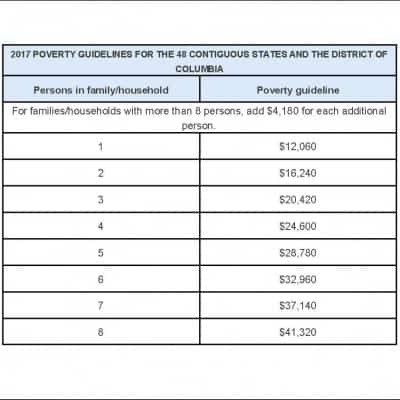 The chart below provides you with a general idea of the income level you would need to be at to qualify for head start. Do not take these levels as “the gospel” though, because again this is simply an example. To ensure that you qualify for head start, you will need to contact local a “registration agency”. These agencies are the will screen you to ensure you qualify for services. Later in this guide I will provide more information about a registration agency as well as the best place to find one. Are Head Start Programs Free? Yes, head start is a free program as meet income guidelines like the ones above. One quick way to determine if you qualify for Head Start is whether or not you have a benefit like Medicaid, SNAP or TANF. If you have any of these benefits it’s a good chance that you qualify for head start. What Zip Codes Do Houston Head Start Serve? Head Start was created to service low-income families, therefore many of the programs will be located in these area. The first qualification of Head Start is to meet income guidelines. The second is to live in specific zip codes. Each head start services one maybe two zip codes. Later in this guide we will show you how to find the Houston Head Start Programs that provide service in your area. There are 3 types of Houston Head Start Programs; Head Start, Early Head Start and a combination of the two. The major difference between these programs are the ages of the children. This program accepts children from the age of 3 to 5 years old. Note: In most Head Start Programs, children must turn 3 or 4 years old on or before September 1st to be accepted. These programs serve kids from birth to 3 years old. These programs are a combination of the two mentioned above. At these sites they accept children from birth to the age of 6. What Services Do Houston Head Start Programs Offer? What Services Do Houston Head Start Programs Offer To Families? What Documents Are Needed To Register For Houston Head Start Programs? In this section I will explain the purpose of “head start registration agencies”. Think of the head start registration agency (or non-profit organization) as the “gate keeper” to head start services. These registration agencies must screen you to determine that you qualify for head start. The head start program awards registration agencies or non-profits with grants that pay for the cost of your child’s head start program. In summary, you must apply for head start through a registration agency for services. If you visit your local head start, they will likely refer you to the registration agency that they work with for enrollment. Next, I will tell you about the most common head start registration agencies in Houston. 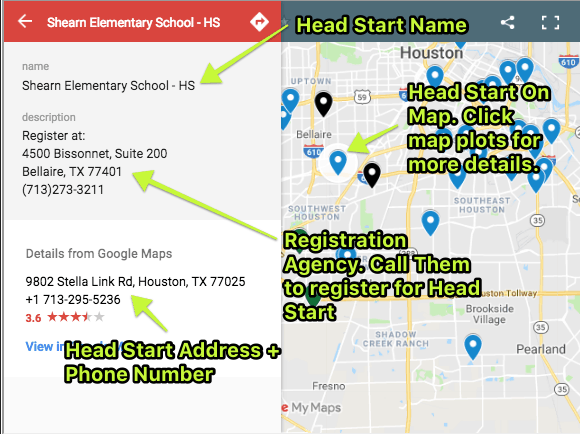 If you live in Houston there is a good chance that you will have to contact one of the registration agencies below to enroll your child into the head start program. Should you stay outside of Houston city limits you may have to contact your school district to register for head start. Aldine, Montgomery County and Brazoria County schools all require you to contact the school district to register for a head start program. In the following section we’ll show you a couple ways to find both head start programs near you and the correct registration agencies to apply. Head Start Programs are zoned to certain zip codes. You must live in the vicinity of the head start program you are applying for. The first way to find a head start program that services your zip code is to use the map below. Head Start Programs are colored in blue. Early Head Start Programs are colored in red. Head Start Programs and also have an Early Head Start Program are colored in green. The Head Start Registration sites are colored in black. Once you local your neighborhood, search to see if there are any head start programs near you. Click on the listing nearest you see information regarding the ages accepted and which registration agency you need to call to enroll. The image below is what it looks like after you click a map plot. The second option is using the head start search box. Type your city or zip code into the search bar and click search. From here you will be taken over to the Head Start Center Locator. Next, you will be taken to another page where you will be given a lists of search results. Find the head start programs that match your own zip code and call it’s registration agency. If you cannot find your exact zip code call the first couple results anyway. They may still be able to provide you with help. Houston Head Start Programs are great because they provide your child with the tools they need to prepare for life. They also give you peace in your home if only for a few hours. It’s a win win! One thing I didn’t mention, is some head start programs have wait lists. If you run into a waitlist, sign up anyway that time will pass. Also be sure to follow up on a weekly basis to see where you are on the waitlist. My neighbor, Mr. Carl, once called our city public works department twice a day for one month to get the ditches dug in our neighborhood. He boasted about his accomplishment and told me “Nick, the squeaky wheel gets the oil”. Take that lesson to heart in everything that you do. But I digress. Does your child attend a head start program? If so have you seen any improvements academically or socially? Tell us about it in the comments below.